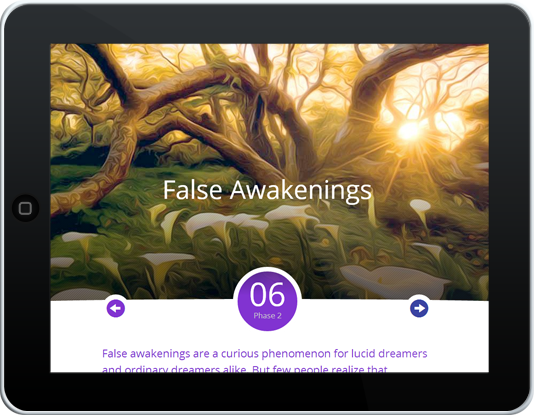 Learn to lucid dream. Fast. 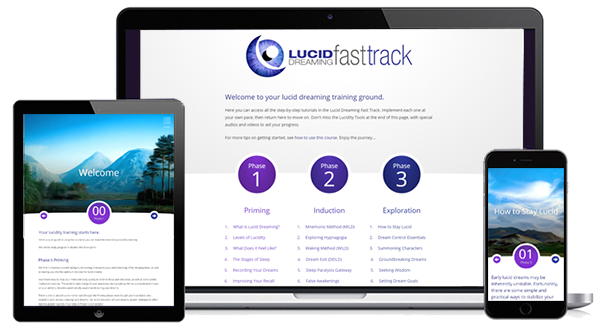 "I loved your course and had a lucid dream 3 days after reading"
If scouring the web for free info and trying to piece it all together isn't delivering results for you, it's time to try a proven program. 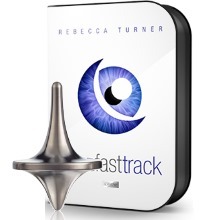 We call it the Fast Track for a good reason - because we guarantee you'll have multiple lucid dreams within 30 days. You will join over 5,831 other members who have joined our online platform to teach themselves the art of dream control since 2013. Learn on your tablet or mobile from the comfort of your couch as you relax in the evenings (we suggest a cup of chamomile tea to go with it)! 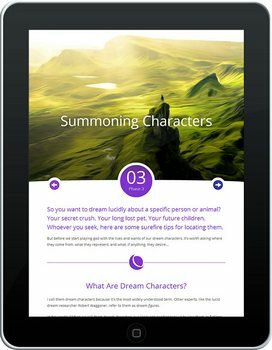 False Awakenings - step-by-step techniques to convert them into lucid dreams. Nightmares - how to take control and turn them to lucid dreams. 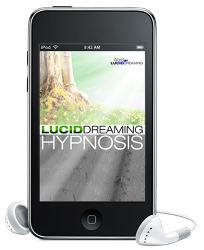 Digitally Mastered Hypnosis Audios - become hypnotized into a half-sleep state, from which you receive lucid dreaming auto-suggestions. Brainwave Meditation Sound Waves - prepare yourself by reducing mind chatter and cultivating feelings of inner calm and bliss. It was amazing! I loved it! 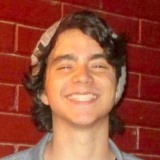 Thanks to it I was able to start lucid dreaming regularly. 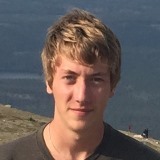 Lucid dreaming was an incredible experience, as I was able to explore my mind's interiors. Thank you very much! Great collection of information! 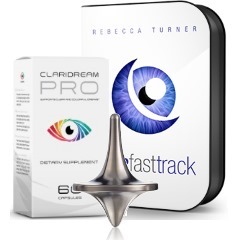 Perfect for anyone just starting out lucid dreaming. Great layout and pictures to kind of explain the topics too. 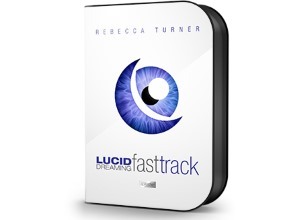 Lucid Dreaming Fast Track had a great influence on my life! 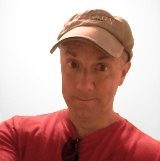 Not only can I recall my dreams more often and better, I finally got rid of some awful nightmares I was having. This was exactly what I have been looking for! Well done, simple, complete. 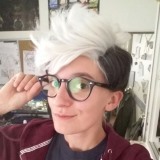 Not too much info - just enough. Easy to get through as well. Fun and inspiring. Thanks. Love it. Ever since I got introduced to the course, I’ve been fascinated with Lucid Dreaming. I intend to stick to it for life. 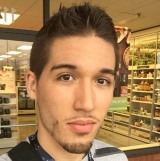 Thanks for your wisdom! 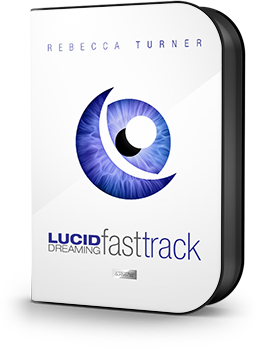 Have lucid dreams within 30 days... or your money back! If you don't get results, you don't pay. Instant refund, no questions. There’s absolutely no-risk in giving it a try!